“Oh Danny boy, the pipes, the pipes are calling”. Quite the lament! If your plumbing pipes ever call to you during cold weather, you’ll be singing your own sad song. Slow water flow, bulging pipes, and, worst of all, plumbing leaks can occur when temperatures dip below freezing if you are unprepared. When water freezes, it expands. Plumbing pipes, unfortunately, don’t share that same quality. They are quite rigid, so when there’s too much expansion, the frozen water can actually split the metal. Needless to say, water should stay in plumbing pipes and only leave at the designated exits. There are few things worse than finding your basement or garage soaked and flooded from a spewing pipe! Why? Recovering from a burst pipe can easily cost thousands of dollars (check out this flood cost calculator for some terrifying numbers). And that doesn’t even take into account the risk of microbial growth and that dirty “m” word (cover your ears, kids: mold). Frozen pipes are no fun, but since an ounce of prevention is worth a pound of cure, some simple precautions will go a long way toward keeping your home dry this winter. Insulate any and all pipes in unheated areas: crawl spaces, basements, outside walls, etc. Pipes in these areas are always susceptible to cold weather, so make sure to wrap them in foam insulation or, for extreme cold, heat tape. In a pinch, newspaper is better than nothing. Close valves to all outdoor faucets. 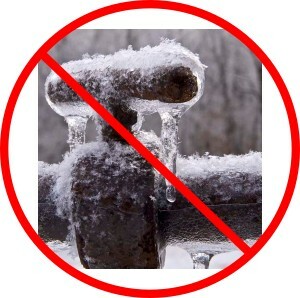 During extremely cold weather, keep your indoor faucets running at a slow drip. This prevents pressure from building should a freeze happen. Keep your home at a steady temperature, day AND night, to prevent thermal expansion and contraction. If you leave the home for an extended period of time, set the temperature to no lower than 55 degrees Fahrenheit. If you’ve already done some or all of these, good for you! I envy your forward-thinking attitude and preparedness. If you haven’t gotten around to any of these preventative measures yet, it’s not too late! Our Michigan winters are as unpredictable as they come, so make sure you and your home’s pipes are ready.